Check out the first trailer for Spider-Man: Far From Home! Lots of speculation and a tease by Tom Holland led to the first trailer for the Spider-Man: Homecoming sequel. Along with it, Marvel dropped a new poster and plot synopsis. 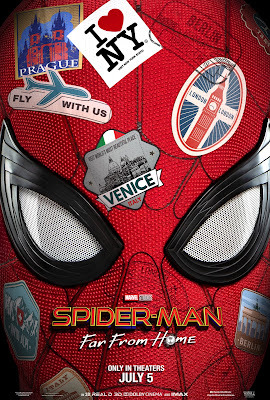 Spider-Man: Far From Home (2019) official plot synopsis: "Peter Parker returns in Spider-Man™: Far From Home, the next chapter of the Spider-Man™: Homecoming series! Our friendly neighborhood Super Hero decides to join his best friends Ned, MJ, and the rest of the gang on a European vacation. However, Peter’s plan to leave super heroics behind for a few weeks are quickly scrapped when he begrudgingly agrees to help Nick Fury uncover the mystery of several elemental creature attacks, creating havoc across the continent!" Nick Fury (Samuel L. Jackson) was missing from the last movie but it looks like he plays a key role in the sequel. And the interpretation of Jake Gyllenhaal as Mysterio is fascinating as he's being set up as a superhero rather than a supervillain. Or is there more than meets the eye? Wink. Wink. Official synopsis: "Peter Parker returns in Spider-Man™: Far From Home, the next chapter of the Spider-Man™: Homecoming series! Our friendly neighborhood Super Hero decides to join his best friends Ned, MJ, and the rest of the gang on a European vacation. However, Peter’s plan to leave super heroics behind for a few weeks are quickly scrapped when he begrudgingly agrees to help Nick Fury uncover the mystery of several elemental creature attacks, creating havoc across the continent!" Check back with the Geek Twins for more Spider-Man: Far From Home movie news and hype! What do you think of the trailer? Let us know in the comments below!